Over the years, we have seen several stars step up or dedicate their performance to a loved one who recently passed away. The most memorable recent one came in 2002, when high-school stud Chris Paul scored 61 points the game after his grandfather died – one point for every year his grandfather lived. Add another one to the laurels. Ohio State freshman forward Jared Sullinger missed the Buckeyes’ pregame shoot-around on Thursday to attend a viewing for his uncle, Harold Sullinger Jr. “Briefcase” died on Dec. 3 from a massive heart attack. 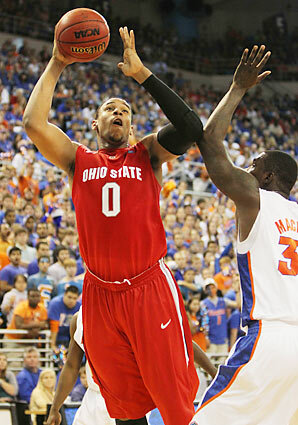 Hours after paying his last respects, Sullinger put up 40 points and 13 rebounds in a 75-64 comeback win over IUPUI. The 40 points set an Ohio State freshman record. 26 of those points came in the second half, many of them as a result of his 16-of-23 performance from the free-throw stripe. With Kyrie Irving possibly missing the rest of the season, Sullinger’s emotionally-laden performance might have pushed him to the head of the national freshmen pack.